A day refers to the amount of time it takes for a planet to complete a single 360-degree rotation on its axis. On Earth, that’s 24 hours. 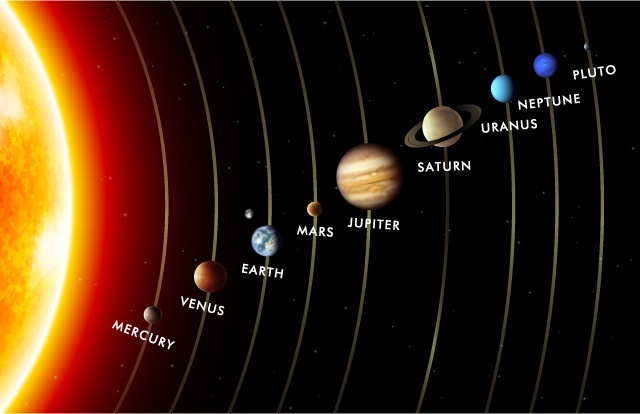 But the other planets in the solar system rotate at faster or slower speeds, and their day lengths vary accordingly. On Mercury, a single day amounts to 58 days and 15 hours Earth time. In contrast, the planet’s years are extremely short: only 88 Earth days. This is because Mercury moves more quickly around the sun, abbreviating its years, while its speed of rotation is slow enough to prolong its days. Of all the planets in the solar system, Venus has the longest day. Its equivalent is 243 Earth days, while its year only consists of 224.7 days, essentially making its days longer than its years. The reason for the discrepancy is its slow rotation speed: while the velocity of the other planets have flattened their poles, Venus has not leveled out anywhere. It also rotates backwards, an oddity that some astronomers attribute to a massive impact with another planet billions of years ago. A day on Mars, which is referred to as a ësol’, consists of 24 hours, 39 minutes, and 35 seconds, making its days similar to Earth time. This is one of many reasons why scientists asserted that plant and animal life could exist on the Red Planet, as Mars is also called. A Martian year lasts 686.98 Earth days, which translates to approximately 1.88 years. Jupiter is the largest planet in our solar system, but it also happens to have the shortest day (9.9 Earth hours), because it rotates more quickly than any other body in the solar system. Its rapid rotation speed has caused extreme flattening at the poles and a bulging equator line. Scientists had difficulty determining day length on Jupiter because it lacked surface features that could be used to calculate its rotational speed. At first storm centers were used, but Jupiter’s storms moved so rapidly that results were inconclusive. Rotational period and speed were finally determined by assessing radio emissions from the planet’s magnetic field. The length of a Saturn day has proven to be extremely difficult to calculate, as the plant is a giant gas entity as opposed to terrestrial like Earth or Mars. The first estimation, which was attempted back in the 1980s, was 10 hours, 39 minutes and 24 seconds in Earth time. A second attempt delivered a result of 10 hours, 45 minutes, and 45 seconds. Using more advanced equipment in 2006, astronomers came up with a measurement of approximately 10 hours and 47 minutes. Some members of the scientific community assert that the length of a day on Saturn will never be known for certain. A day on Uranus is the equivalent of 17 hours, 14 minutes, and 24 seconds on Earth. Because its axis is tilted to nearly 90 degrees, Uranus actually rotates on its side instead of spinning like a top. As a year progresses, one of its hemispheres faces the sun’s light while the other is in darkness for a complete season. What this means is that the planet’s days and seasons are one and the same. Day is as long as summer, and night is as long as winter. On Neptune, a day translates to 16 hours, 6 minutes and 36 seconds on Earth. Since the planet is mainly gas, different parts actually rotate at varying speeds, a process known as differential rotation. Neptune’s equator zone takes around 18 hours to rotate, while the polar regions complete a cycle in 12 hours. Scientists attribute the large difference in rotational rate to Neptune’s winds, which can go up to 2,400 km/hour, making them the strongest in the solar system.